One of the Valley’s most unique and intimate dining events has returned. Save the date for the 2015/2015 Insider’s View Dinner series at Different Pointe of View at Pointe Hilton Tapatio Cliffs Resort. Offering seven exclusive dinners limited to just 12 guests, each Insider’s View Dinner begins with an outdoor sunset wine reception hosted by the owner of the featured vineyard. Dinner guests have the opportunity to mix and mingle with the evening’s winemaker as the sun sets over the city skyline. 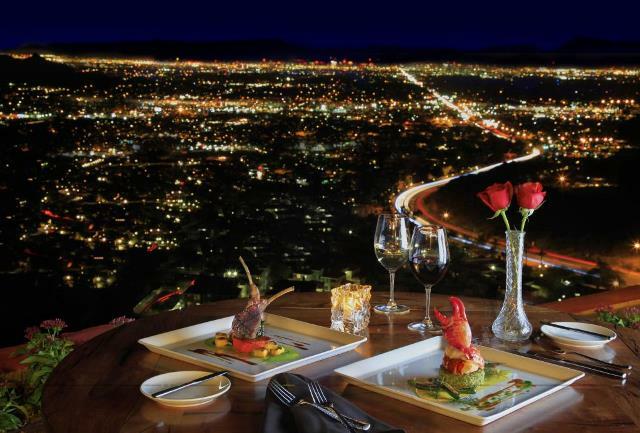 The evening continues in the main dining room overlooking dramatic city and mountain views where Executive Chef Anthony DeMuro prepares a four- to five-course dinner entirely tableside. Reservations are required by calling 602.866.6350 and available for $99 per person, inclusive of dinner and wine pairings. Nov. 13 – Tondi Bolkan, winemaker for Francis Ford Coppola Winery. Legendary filmmaker Francis Ford Coppola bought his first winery in 1975. Today, his winery in Geyserville, Sonoma County, California produces nine different brands of wines. Jan. 15 – Dave Guffy, winemaker for The Hess Collection. The Hess Collection focuses on producing exceptional wines from Bordeaux and Chardonnay varieties, farming estate vineyards on Mount Veeder, at the Allomi vineyard in Pope Valley and at the Su’skol vineyard in American Canyon, near San Pablo Bay. Feb. 5 – Derek Summers, family co-owner of Summers Estate Wines. Creating red-wine from grapes grown on small acreages in both Napa Valley and Knights Valley is the passion of Beth and Jim Summers. The signature wine offered by Summers is Charbono. March 4 – Chuck Carlson, owner Carlson Wines. Chuck Carlson’s winemaking career in Santa Barbara County spans more than 34 years, including the past ten years as the proprietor of Carlson Wines, specializing in limited-edition wines including Pinot Noir from Santa Rita Hills along with Cabernet Franc and several aromatic white wines from the Santa Ynez Valley. April 1 – Steve Nelson, wine maker for Chalk Hill. Winemaker, Steve Nelson, and his dedicated staff gently shepherd the grapes through the fermentation process to the bottle. With an estate-wide, shared aesthetic, the process is light-handed, non-invasive, and sustainable, allowing each bottle to emulate the essence of the vineyard. May 13 – Dan Parrott, CEO/co-owner of JAX Vineyards. Using the grapes from his father’s vineyard, Trent bottled and produced his first vintage in his San Francisco garage in 1996. Today, JAX produces high quality wines, with a chic label, and fair price point.